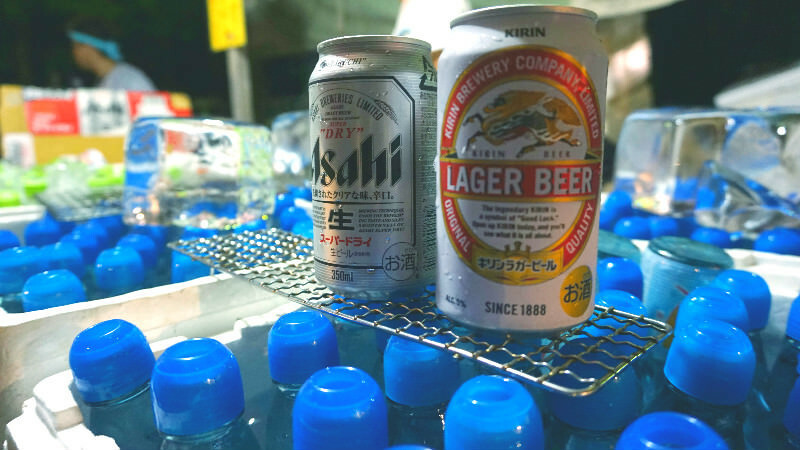 Second part of Sharing Kyoto's Mitarashi Festival Report, where we finally get to the beer and all the yummy stuff! In the first part we covered the core parts of the festival. Our report centered on the ritual of steeping your feet in the Mitarashi pond and the prayer for good health written on the wooden foot-shaped block. It was all new to us too, so it felt really fresh! 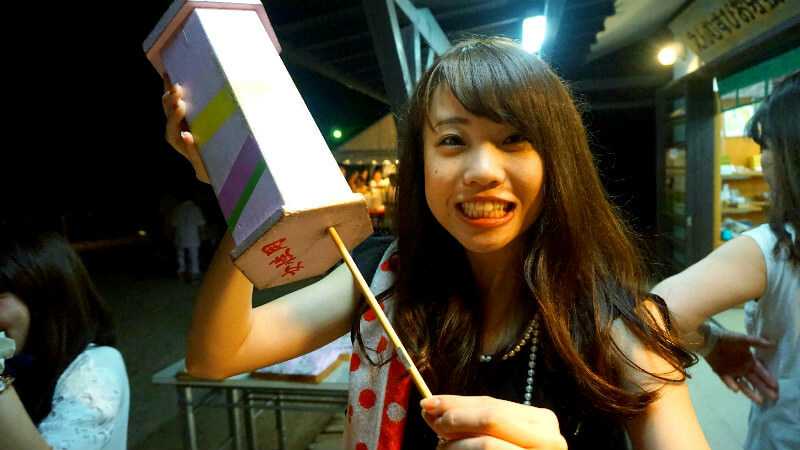 Especially walking in the pond and offering the candle at the altar, and the foot-shaped wooden block were things you cannot experience at other festivals! 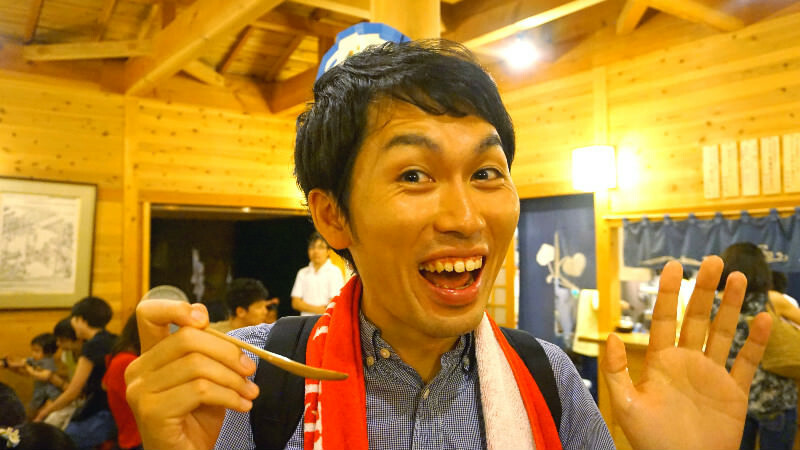 In the second and final part we are going to tell you about the more exciting parts of the Mitarashi Festival! 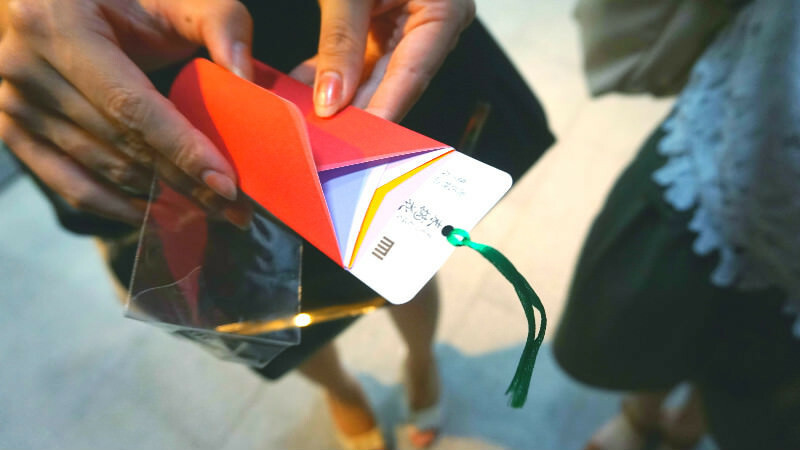 We are going to tell you how to enjoy the festival like a local! What follows are our recommendations for the most interesting things you can try at the festival. 19:30 Start the Second Half of the Mitarashi Festival! It’s getting dark. The sky was brighter than usual this day, the deep blue of the sky feeling almost too imposing. 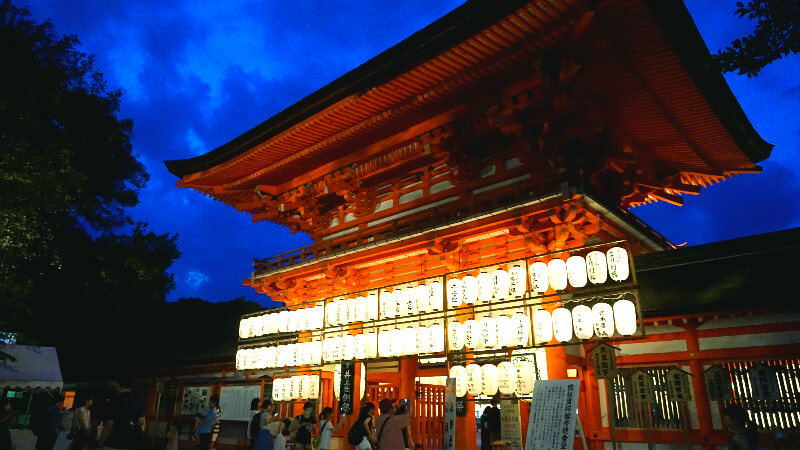 The vermillion of the gates and the light of the lanterns coming together with the deep blue sky, gives the place a majestic quality. Just what you would expect from a world heritage site like the Shimogamo Shrine! This You Have to Try: 2. Test Your Marriage Fortune! Sharing Kyoto challenge yourself to try this tip number 2! 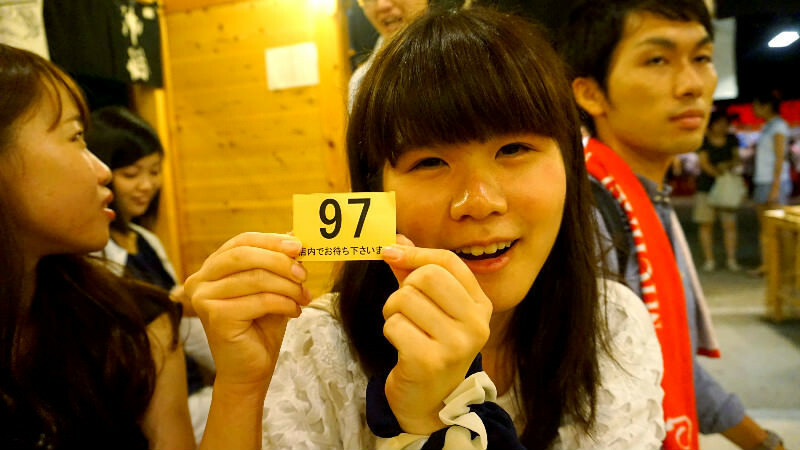 Draw a marriage fortune omikuji fortune slip and draw in a good match for marriage! 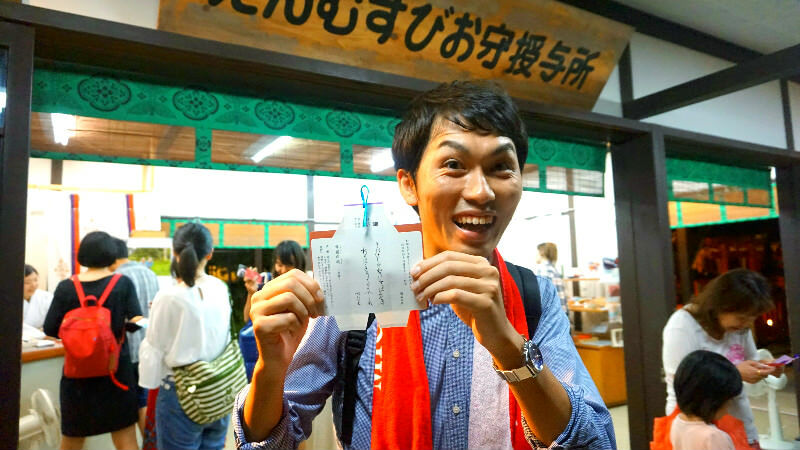 Inside the shrine, there is a place where you can draw omikuji fortune slips. No matter how old you are, fortune slips are something you can’t resist… Straightaway, Erika and Shiho are ready for the challenge! 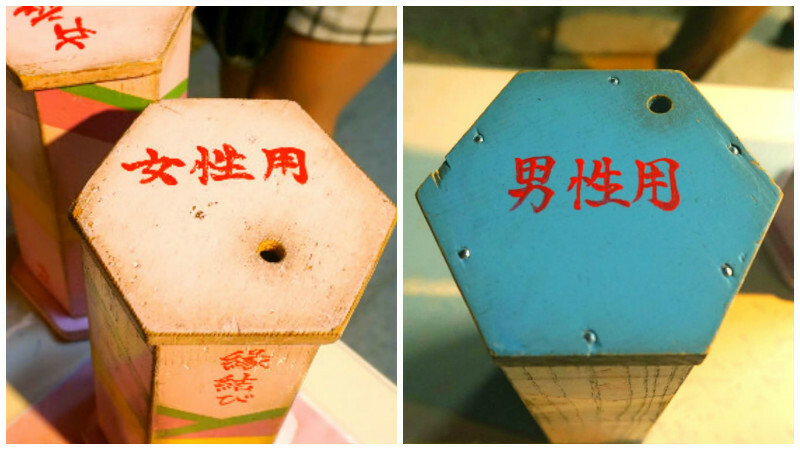 There are two omikuji boxes, the pink one on the left for women and the blue one on the right for men. Shiho is desperate for a good match! And here are the fortune slips we drew! The Shimogamo Shrine’s fortune slips are “wearing” kimonos because of the connection with the Tale of Genji, a Japanese novel written over a thousand years ago. The kimono-wearing fortune slips are really cute! A drum roll please… what will Erika’s and Shiho’s marriage luck be like? Too bad… Shiho got a small blessing, but she was aiming for a great blessing, so she was quite disappointed. About relations the fortune slip said the following: “Are you sure about your feelings? You need to first ask yourself that.” Shiho says she will calm down and think about this thoroughly. On the other hand, Erika is looking cheerful. Her result is a blessing! 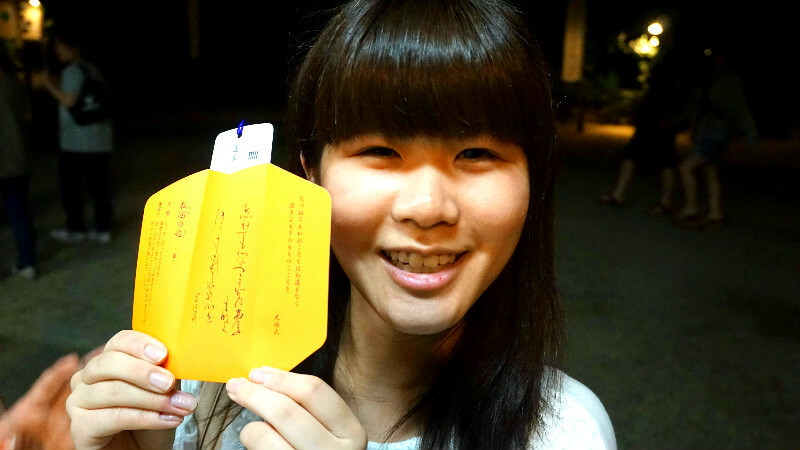 Even though a blessing is a worse result than a small blessing, Erika is happy about the fortunes written on the fortune slip. On encounters the slip said that Erika will have a bright future. Her expectations are high for the year to come! And it is a great blessing! So miracles do happen… We have to say, Miya is really lucky! 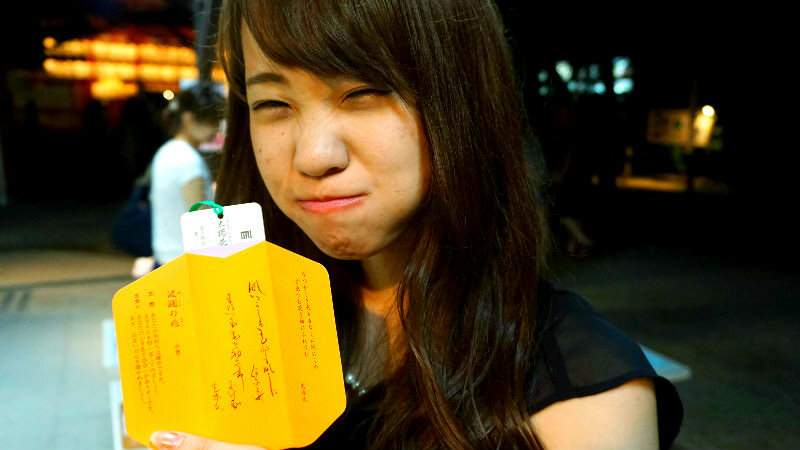 Most omikuji fortune slips are divided into seven categories: great blessing, middle blessing, small blessing, blessing, ending blessing, curse, and great curse. The great blessing is the best, luckiest one while great curse is the worst one you can draw. If the fortune slip was not as lucky as you would have hoped, tying it to a tree on the shrine premises is the Japanese way of getting rid of the bad luck. Before going home, remember to pray at the shrine for a good relationship with the gods. 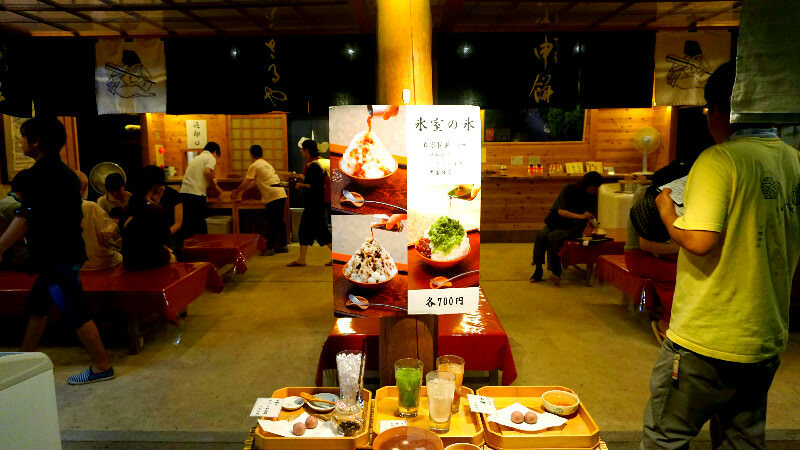 Inside the Shimogamo Shrine premises there is a stall called “Saruya” by the famous and long established traditional Japanese sweets shop Housendou. 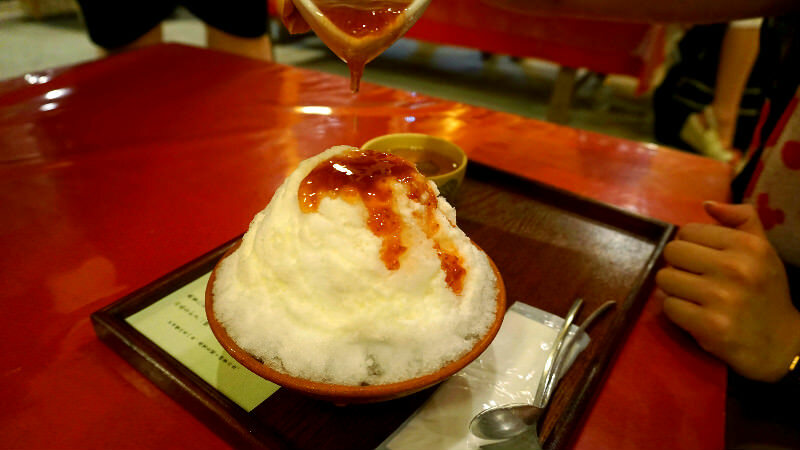 Here you can have shaved ice(kakigoori) that melts in your mouth like soft snow. At Shimogamo Shrine they have a ritual where they leave snow from the last winter for the summer in the Forest of Correction to be used at a ceremony in the middle of summer. 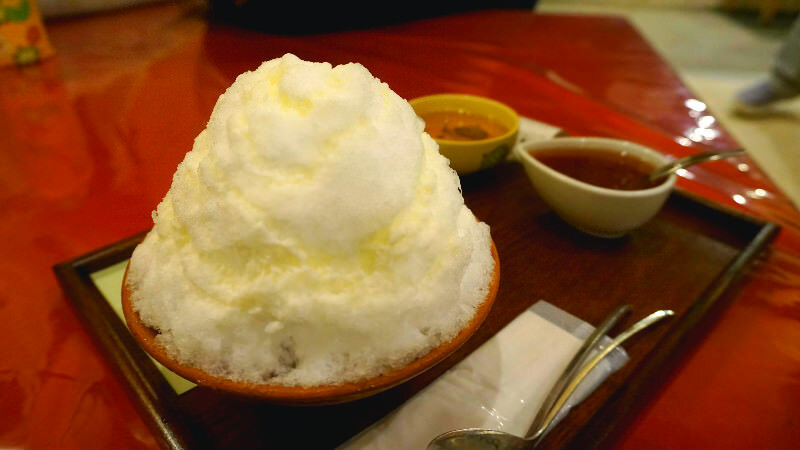 The shaved ice they serve at Saruya is said to be as white as this snow used in the ritual. Since you went all the trouble to come to this festival, time and your stomach permitting, we definitely recommend you try some shaved ice at Saruya! We of course had to have some shaved ice too! The shop was bustling with people. After ordering, you get a number and are told to wait inside the shop. We sat on a bench and had a little break. Miya seems to be getting a little sleepy. The long-awaited strawberry shaved ice is here at last! They have topped the shaved ice with condensed milk. Time to taste some shaved ice! 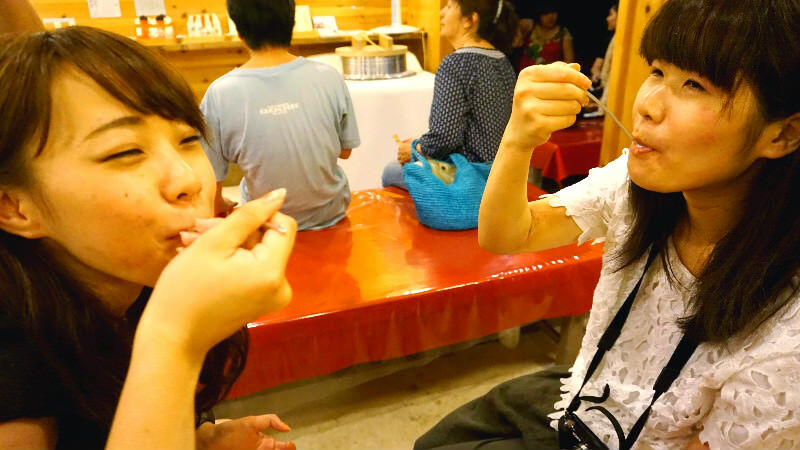 As you can tell from Miya’s expression, the shaved ice is really good! The portions are really big so we recommend you share your shaved ice with someone. This You Have to Try: 3. Let’s Play at the Stalls! There are tens, almost hundreds of stalls on the shrine premises! 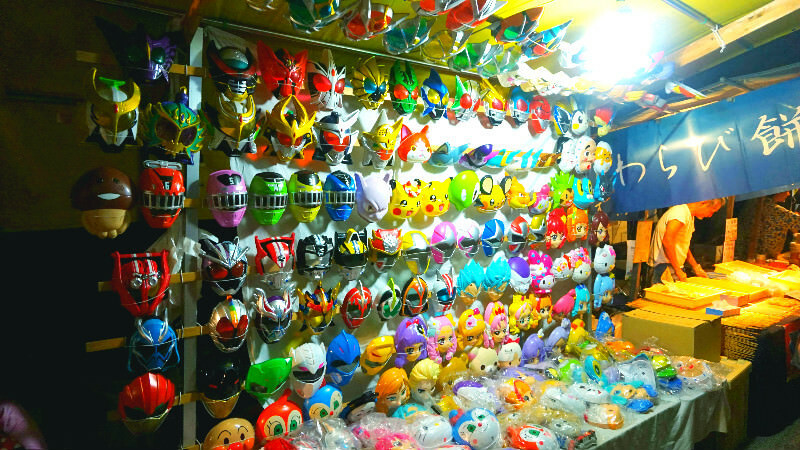 Like this picture, you can buy character masks, or you can play at a shooting booth, so there are also many booths that don’t sell food. 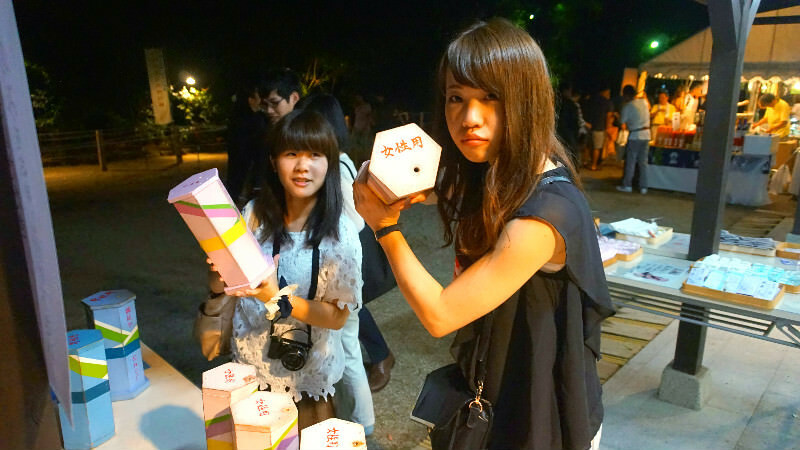 Our recommended way of ending the festival night is to eat, drink, and play at the stalls! 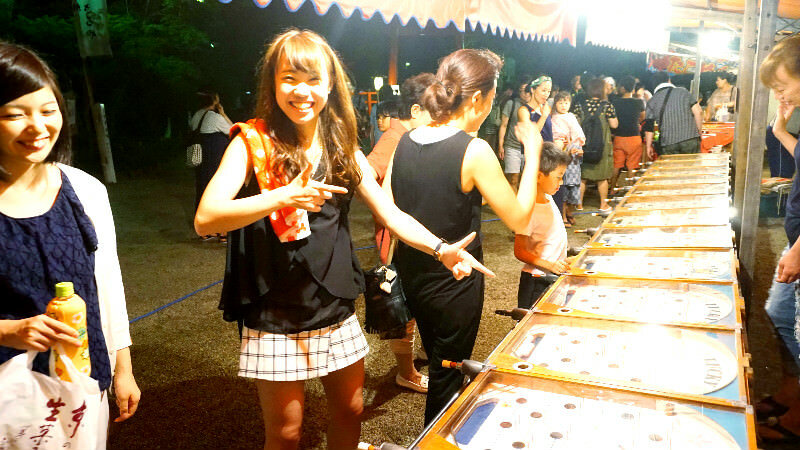 Here Shiho is playing a pinball-like game called “Smart Ball” for the first time. If you get the balls in the holes you can win prizes! At a festival, you cannot forget beer! It is almost a tradition to go to the stalls with a beer on one hand. 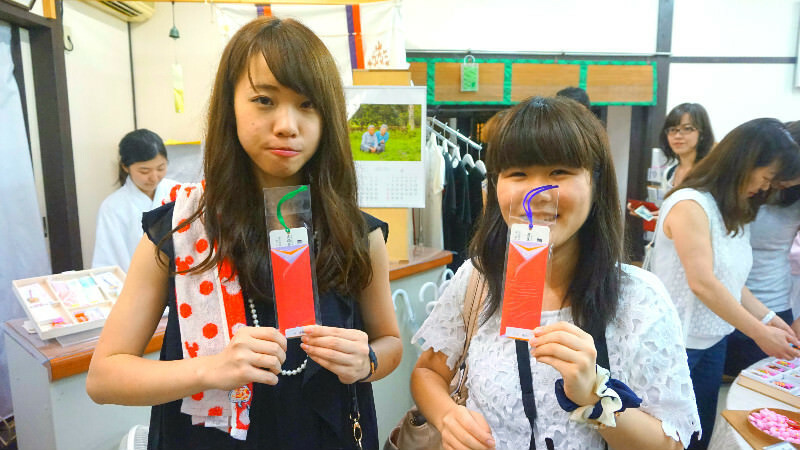 If you want a non-alcoholic choice, we recommend you try a Japanese festival-favorite called Ramune. This carbonated soft drink sealed with a marble is a Japanese classic that everyone has fond memories of. 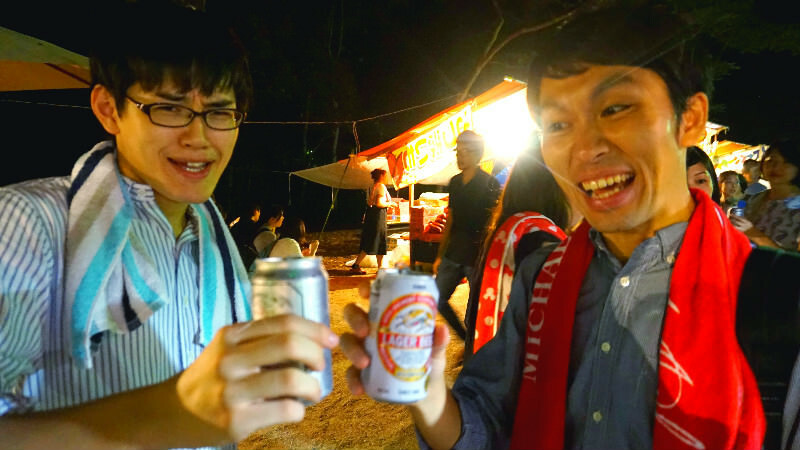 Miya and Takuya can’t wait to have some beer! Cheers! 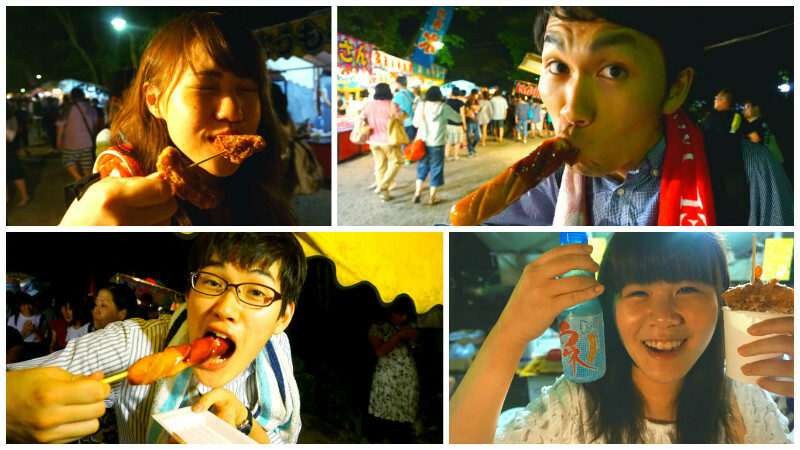 All of us from Sharing Kyoto had some yummy festival treats! So, how did you like this Mitarashi Festival that takes place at the world heritage site Shimogamo Shrine? 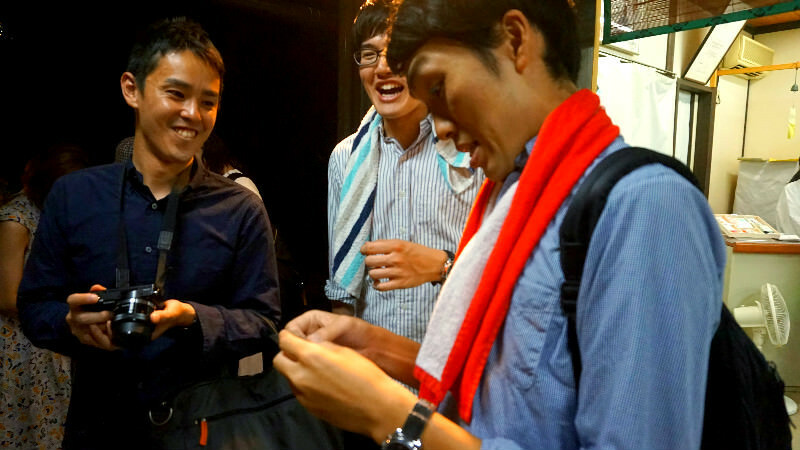 It differs from all the other festivals that take place in Kyoto, but we really enjoyed Mitarashi Festival a lot. The festival takes place every year, so if you are coming to Kyoto next July, we recommend you experience Mitarashi Festival first hand! Contrary to the somewhat dignified, serious atmosphere of other Kyoto festivals, the Mitarashi festival is more casual and perhaps easier to enjoy. You can go to the festival with your friends, partner, or anyone! We are sure you will enjoy the festival.